If you need a little baking therapy, but don’t have the energy to go shopping for ingredients, this recipe might be just what you need. It was for me. I didn’t have chocolate chips and had to use chopped milk chocolate for the topping, but other than that there weren’t any issues and I plan on making these again. 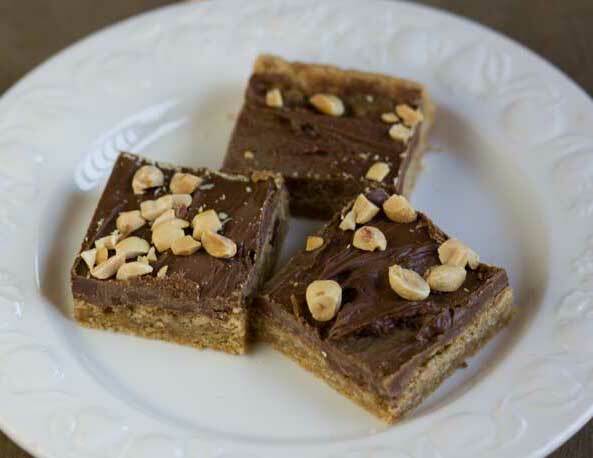 They’re a little thinner and more cookie-like than some of my other peanut butter bar recipes, but overall they are very good. These are very easy to make. The original recipe calls for a 9x13 inch pan, but that makes a very thin bar. For a slightly thicker, easier to spread crust, use a 9 inch square pan. Preheat the oven to 350 degrees F. Line a 9x13 inch pan with parchment paper or nonstick foil. For a slightly thicker bar, use a 9 inch square pan. In a mixing bowl, stir together the butter, peanut butter, granulated and brown sugar, egg, vanilla, baking soda and salt. When thoroughly mixed, add the flour and stir until incorporated. Stir in the oats. Press the batter across the bottom of the prepared pan and bake for 18 to 20 minutes or just until it appears set and the edges are browned. Remove from oven and immediately scatter chocolate chips over the top. Put back in the oven for 1 minute. Remove from oven and let the chips sit until they are soft, then gently spread the softened chips with the back of a spoon. Let cool at room temperature for about 20 minutes, then put in the refrigerator to set the chocolate. Sprinkle with chopped nuts while the chips are still semi-soft if desired. Lift from the pan and cut into squares. It should take anywhere from 18 to 20 minutes. If you have doubts about this recipe, here’s a similar one from Betty Crocker. They frosted theirs, but I used melted chocolate chips. The bars are thin. If you have trouble spreading the dough, try using a piece of parchment or nonstick foil to press it down. trouble getting the dough to fill the 13×9 pan to the edges…. very sticky to work with and thin in some parts.